Automotive Fuse Box is a framework for automobile applications. It is meant to make your applications easier to create and maintain. It does this by helping you structure your application and break things down into discreet pieces. 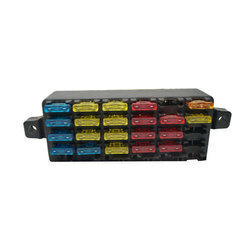 We are offering Fuse Box in 4 Way and 6 Way that is used in varied applications. The current rating of these Fuse Boxes is defied as per customer’s requirements. Our range is thoroughly tested by our quality analysts and is in accordance with international quality standards. We are one step ahead of our competitors in offering a uniquely designed range of Automotive Fuse Box. We offer Automotive Fuse Box for all the vehicles including TATA vehicles, Maruti vehicles, Mahindra vehicles. We are basically looking queries from Bihar, Orrisa, Jharkhand & Kolkata regions. We are one of the leading manufacturing companies of Automotive Fuse Box. To sustain the industry standards, experts also check this product on varied industry norms.